The downloadable CD/DVD Label Maker Windows software program from Acoustica lets you create custom designs for CDs and DVDs, so you can print professional looking media using your printer. CD/DVD Label Maker also allows you design covers for jewel cases, DVD cases, and Blu-ray cases. Moreover, it is compatible with LightScribe optical drives and supports a wide variety of paper labels and printers. CD/DVD Label Maker comes with additional features to make your custom design experience easier by automatically placing your music track list on the label and offering hundreds of label designs along with one thousand background images. Additionally, custom art is offered for holidays and special occasions such as Christmas, Valentine's Day, birthdays, vacations, weddings, and more. CD/DVD Label Maker (Download) is rated 3.0 out of 5 by 1. Rated 3 out of 5 by Rev Ed from Friendly Composition Unfriendly Printing Composing the templates is an easy chore. I am very pleased with being able to import graphics and pictures with ease. The printing seems odd you cannot print multiple copies with bulletin insert and cover. You have to run it through for one panel print only. Of course you for sure cannot print more than one template at a time. For the price it is good and you just have to put with the time consuming extra labor to print the labels. Can this download be used on more than one computer? No, I am sorry but the Acoustica CD/DVD Label Maker (Download) B&amp;H # ACSCDDVDLM can be used with one computer / one user. Will this software work with Avery Labels? Unfortunately no. 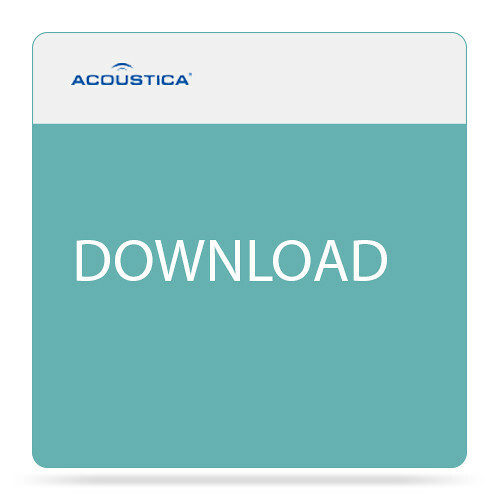 The Acoustica CD/DVD Label Maker (Download) B&amp;H # ACSCDDVDLM is a stand alone software. Is this download compatible with more than one device? No, I am sorry but the Acoustica CD/DVD Label Maker - Download (B&amp;H # ACSCDDVDLM) is intended to be used with 1 device, 1 user. Is there a list of compatible printers available? Where can i find the list of printer compatible with this software? The software is pretty much universal, it will work with most printers.